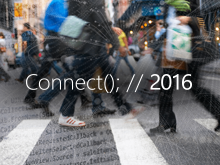 Great session on xaml / c# approach, but was expecting more coverage of html/js approach too. For instance, if I'm building more than just wp8/win8 and on iOS & android where xaml approach not relevant for cross platform. Any resources would be useful. Slides: I am chasing this issue. Hopefully that will be remedied shortly and the slides will be made available. API Quickstart Poster: I believe this is the API compatibility chart to which you are referring. I am told that a PDF version will be made publicly available this week. Code: We are going to ship the code as a sample on Code Gallery. We hope to make it available in the next few days, but it might be next week by the time we get it uploaded. Thanks for your patience. You can follow me @AndrewJByrne and I will announce updates through twitter too. 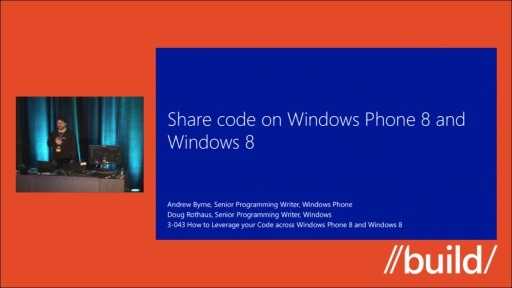 The code for the app shown in this session is now live on MSDN Code Gallery. Thanks for your patience, and happy coding!